Today is Game of Thrones night. I promise that I will not post any spoilers online. That is: I won’t just try my best. I will make sure, by not writing and then publishing anything until I’ve thought about it long and hard. Friends—you know who you are—you can hold me to this promise. 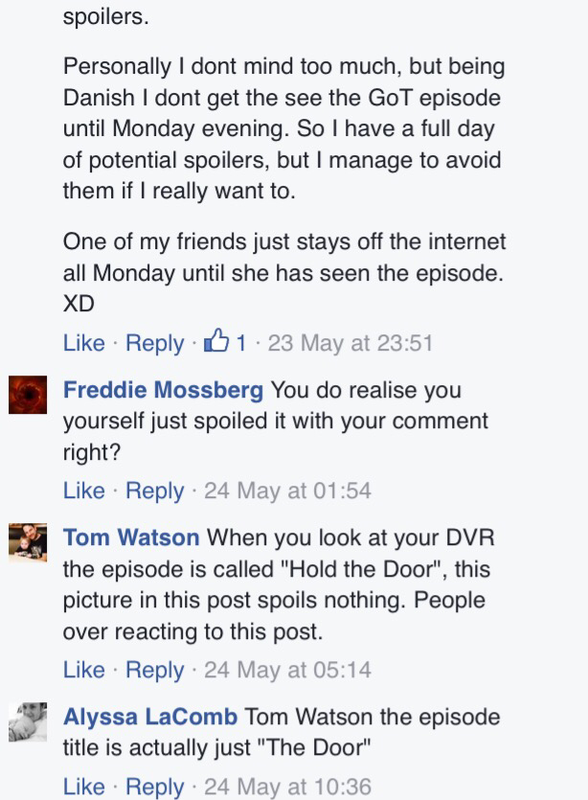 Spoilers were amongst some GoT-related topics discussed last Sunday and Monday. I feel that my duty of care to friends is greater than a desire to be the first (or the umpteenth) to say something witty (or not). Friendships, compassion, and respect for others’ reading is more important. If you can’t make a witty comment that only makes sense for someone who’s seen the episode, don’t say anything. And if making an in-joke, try to ensure it sounds enticing and inviting; rather than snide and excluding. (This is also more of a creative challenge, and therefore more fun for you the writer; as well as more fun for readers.) We should all be in the happy endeavour of creating and maintaining a community of reading. POSTMORTEM COMMENT: I think this was OK, but the fact that I’m not 100% sure and worried and worrying makes me ponder…. 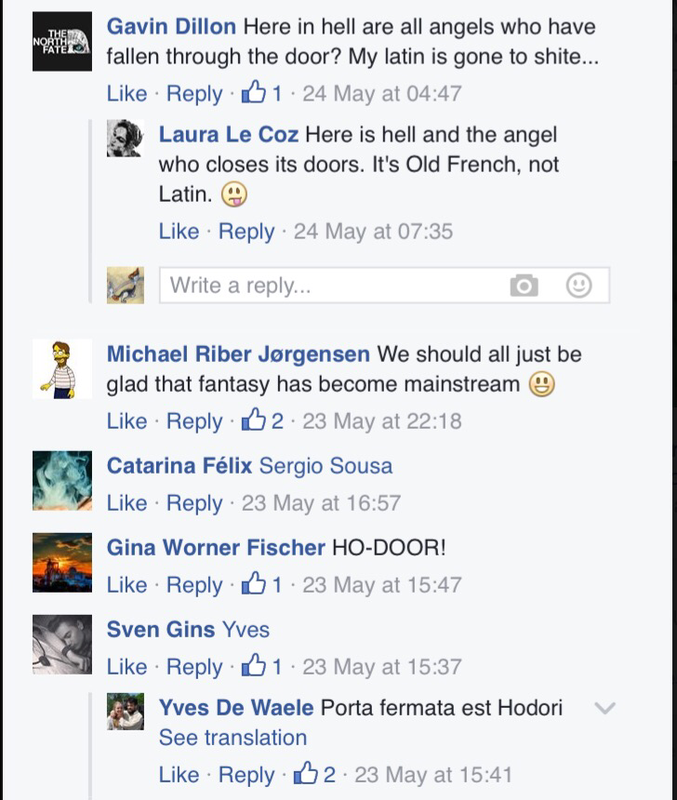 My friend NP: Trying to interpret all the GoT “Hodor”/”Hold the door” references in my news feed. NP: I don’t really watch it anymore, tbh. I am interested in the plot lines but because I can’t handle the violence and horror I tend to get my info second hand. NR: want me to tell you? RR: That episode was a combination of fast-forward plot points and some terrible terrible writing. You can really tell we have gone ‘off-book’ here. BSWB: Yep. I guess they couldn’t follow up last week’s excellent work with anything even approaching it, so they went for the opposite. Juliet O’Brien: Agreed with RR, but there was also a symmetrical frame of poignance and some nice uses of (much-needed and too underused) silences. […] is moving from victim to survivor, and cold anger, which is A Good. I don’t know if That Scene can be remedied, but I’m sure I’m not alone in wanting to see her repaired and become another of the stronger women characters. I worry that […]’s possible amorous thread might be played for low comedy. POSTMORTEMISING COMMENT: I was trying to do the right kind of commenting here—to encourage someone to return to viewing, for feminist reasons—and trying not to err into the wrong kind, for the wrong reasons. 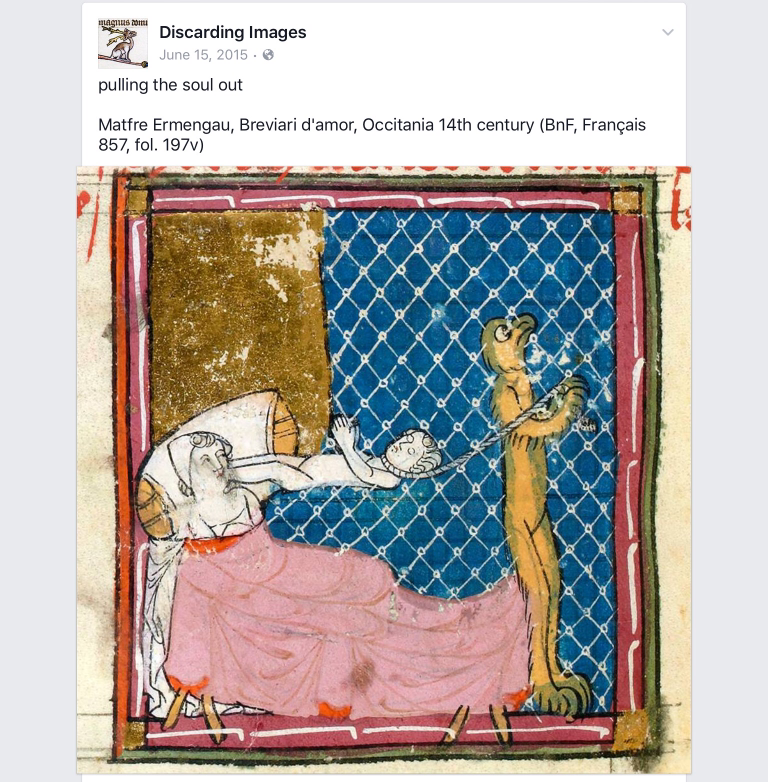 COMMENTS: this gives some idea of some of the “rights” of commenting… and we’ll see some differences between medievalists (possibly more sophisticated, possibly more sensitive) and the general public. 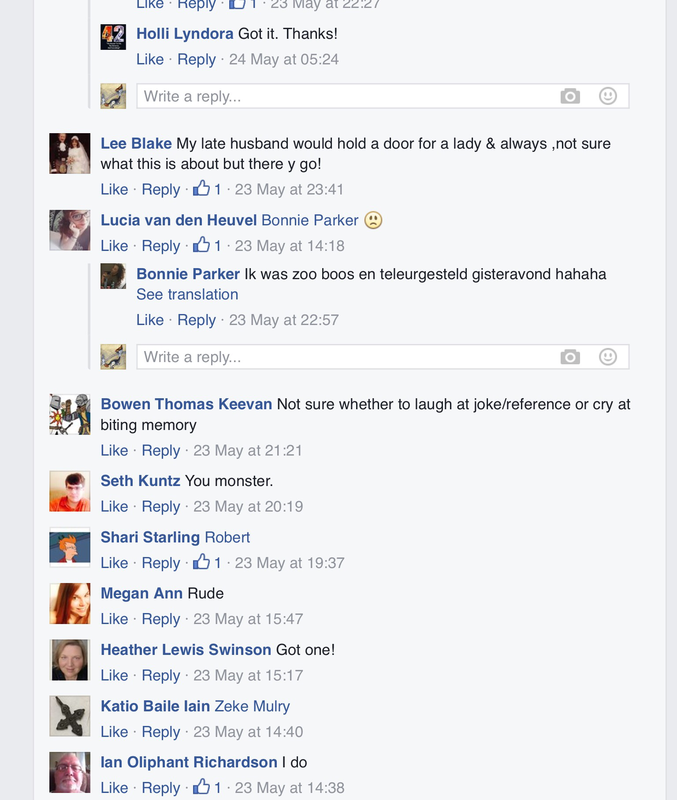 COMMENTS: classy medievalism at its classiest. That is all. Doesn’t make sense. Therefore not funny. Too many spoilers, spoiling my feed, unliking this page. Honestly, first thing to sprung to my mind was Vox Machina’s stellar record against doors. We’ve had trouble’s with mimics posing as doors, we precautionally torch every house we come upon now. Libertarians Making A Point, or rather, turning All Points in the direction of free choice (and their own superiority). BP: Yes, stay offline in the digital age, or maybe, people could just not be jerks and blatantly post public spoilers out of respect for other humans. 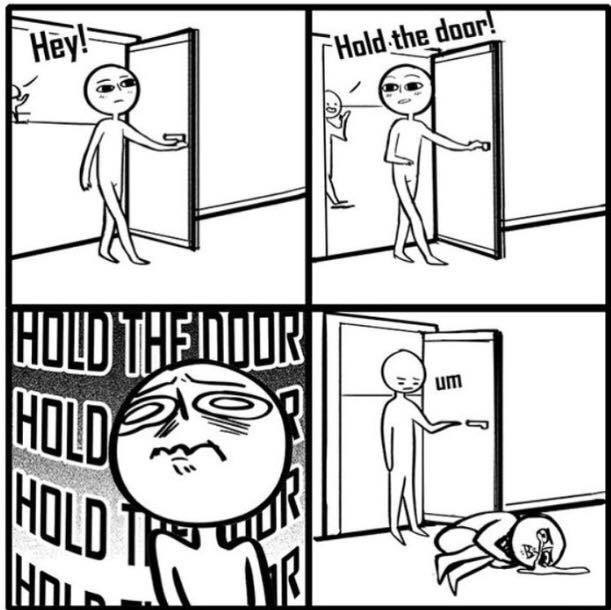 SL: Hold the door by itself is exceptionally vague though, wouldn’t you agree? I’m getting a mixed reaction. Some people, the same ones who KNEW Bruce Willis was dead the whole time & who KNEW that Brad & Ed were BOTH Tyler Durden, THOSE people have actively tracked the phrase to its source. They’ve no-one to blame but themselves. Other people, who are in the most wonderful way grieving for a character who never existed showed how upset they were by using three words which out of context read as a courtesy & not an obituary? SL: I’m actually amazed how much of a fan base that character has. I mean, he/she is no Harry Potter/Hermione Granger, but could you imagine trying to keep that quiet if it happened? BP: I would agree this one by itself is vague and not a spoiler. They are referring to their earlier post that received a lot of backlash. But really, this has been ruined by numerous pages today. Lots of thinly veiled references that pretty much give it away to anyone who didn’t get to see it last night. BP: And true, this was a major outpouring of affection that was kind of unexpected. Maybe more so because of the heroic deed. SL: Absolutely. Some people clearly love to deliberately ruin things for others – we’re not like that. Neither of us has even named the character in question. MP: I don’t think it’s possible for me to like this comment more!! AB: Damn it, thanks. 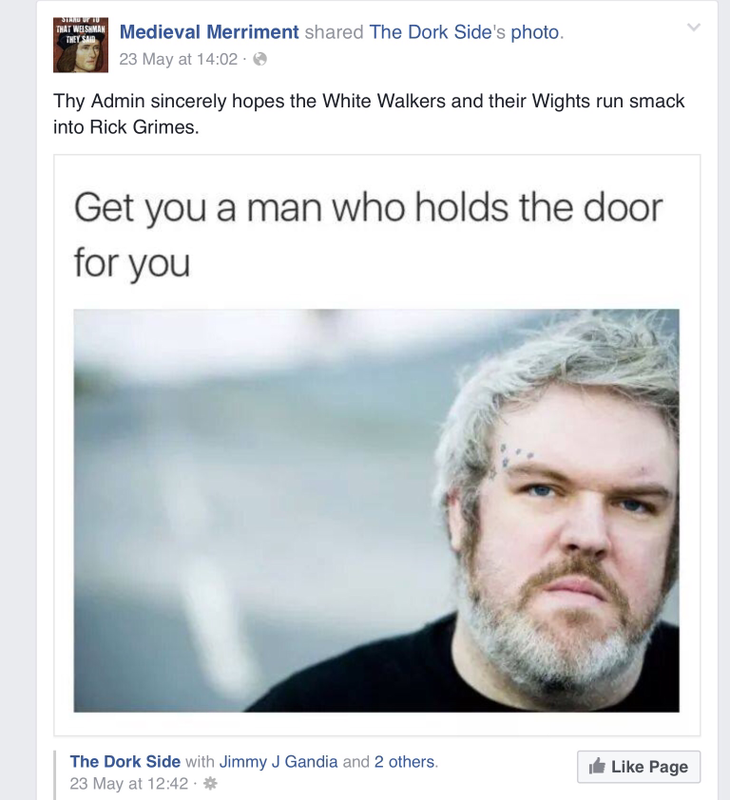 I didn’t know he died but I’d seen Hold the door jokes all over the place. 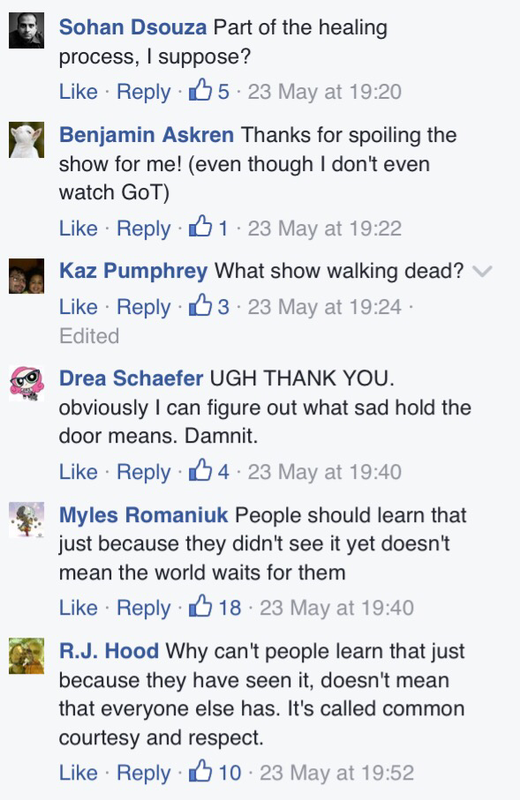 … Why does everyone seem determined to spoil every single thing about the show? (3) a tone, manner, and way of interacting that I disliked and in which I wanted no part. The opposite of the friendly live interactions between friendly live humans at a certain pub; and of the friendly, considered, considerate interactions with others (we may talk about this elsewhere later on, so I’m not posting all the FB material here…) in some other conversations earlier on. JE: About to watch last night’s GoT. 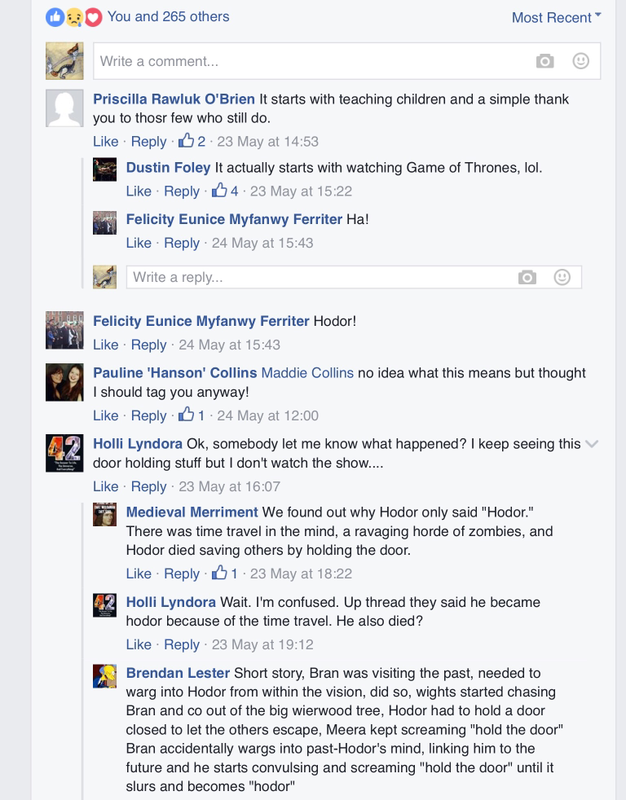 Thanks for all the Hodor spoilers, y’all. DR: Is this a spoiler? Because I hadn’t seen it yet either. JE: Dunno. Apparently he’s a character in the show. JE: I think my point–which DR took even further–is that people shouldn’t say anything about a show or reveal what happened so close to when it aired. You’re making it worse, Juliet. Juliet O’Brien: But but but discussion? And there’s a world of difference between zooming in on and discussing one point, and detailed summary and analysis (or verbatim reporting) of the whole. Tell you what: if it helps, henceforth I’ll preface any post/thread I start that’s about a new episode with SPOILER ALERT and several lines’ spaces. Would that help? I sort if know what you mean though because I’ve been there for all seasons up to now. I’ve actually been totally fine with being at least one season behind for seasons 1-5 due to watching it on DVDs when they came out (or some time later, due to work intervening); even if I read what people were saying and had a vague sense of what was happening, and the debates and discussion-topics, and how the TV show differed from the books (first read about 7 years ago), … even reading these things I found they didn’t detract from my viewing once I got around to it and “caught up”: nothing I’d read was a substitute for my own reading/viewing. 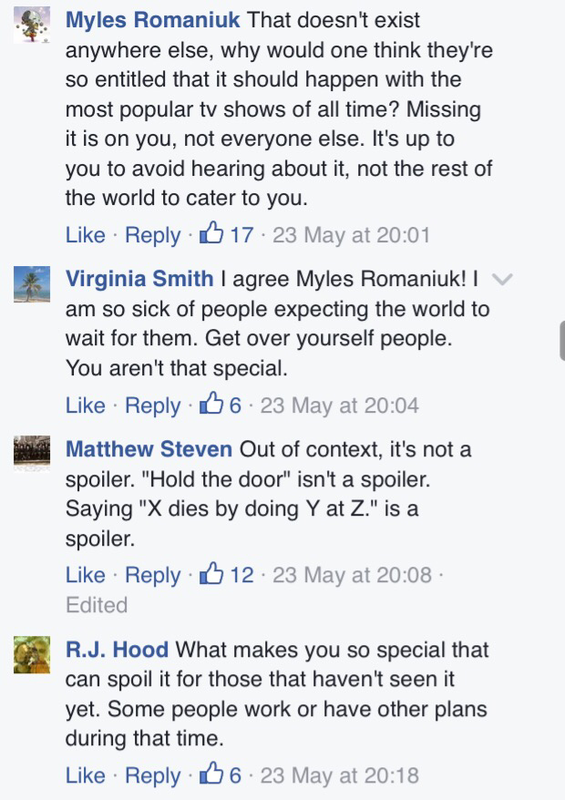 Juliet O’Brien: I still dispute “spoiling”: this is not writing for the negative reason of deliberately spoiling something for someone else, it’s writing for the positive reason of engaging with community who are all in the same situation. —SKW: disregard crying emoji. Hand slipped on phone. Hazard of typing with one hand and holding baby in other. I’m not that sad about this. 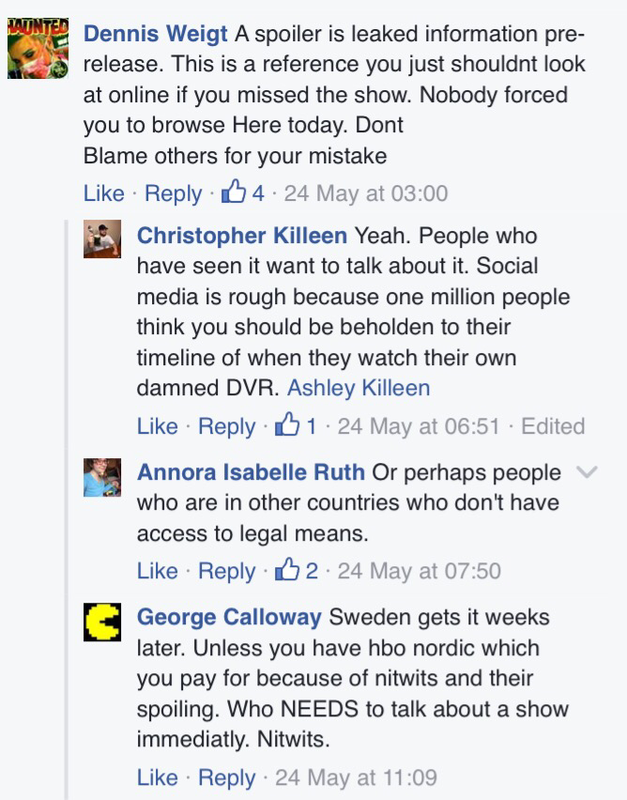 —Juliet O’Brien: SKW totally agreed: so, comment without revelation. This is new to me—first time I’m in this situation with GoT or anything else—so it’s a source of curiosity and wonder. In that way, this would be more like good film reviewing. Hmmm. —SKW: Juliet O’Brien I think best thing to do if one *must* comment immediately is to have something totally non specific or just “read comments for GOT reaction” and then comment on your own post. That way people can choose wether or not to engage in the discussion rather than being totally bombarded just by logging on to FB. But it is better to say nothing right after seeing it if you are in a public forum where your comments will spoil the surprises for others who have not had the chance to see. 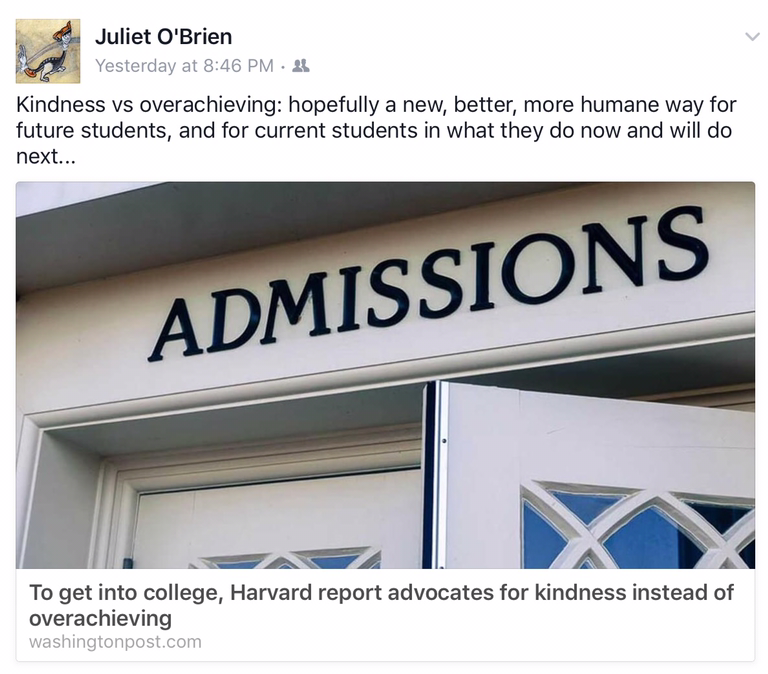 Juliet O’Brien: [continuation from “not writing for the negative reason of deliberately spoiling something for someone else, it’s writing for the positive reason of engaging with community who are all in the same situation.”] Excitement. 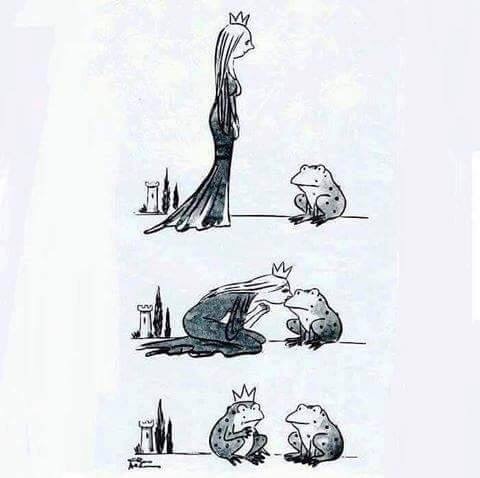 In the moment. Engagement. 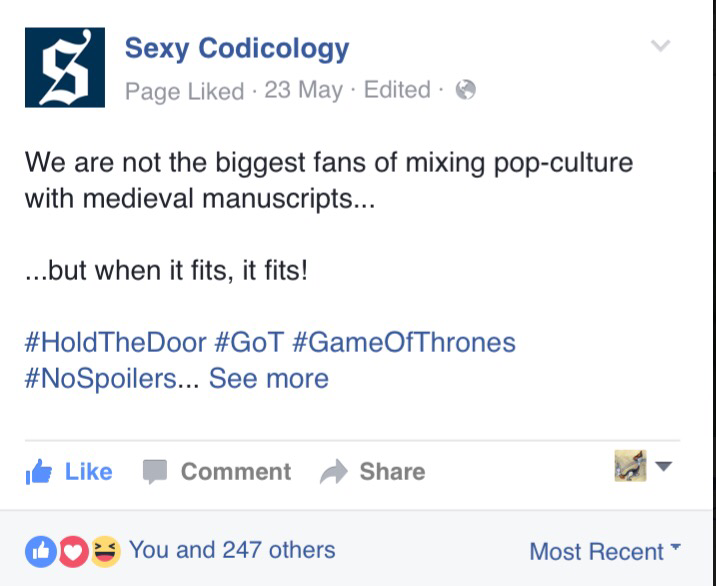 The thing I’d feel uncomfortable about is smugness, self-satisfaction; and the real spoilers are pre-release leaks. That’s dreadful, and just for “me! first! !” stupidity. 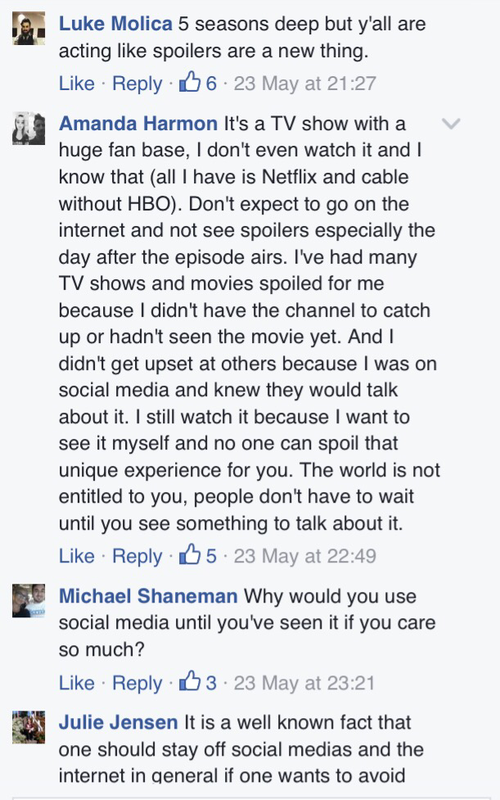 Someone still on my friend list posted about a major death in a finale WHILE THE SHOW WAS STILL AIRING. I mean, honestly. One other thing I noticed: so, I’m watching this with other people (mostly strangers) in a geeky pub. It’s a different—better—experience as a communal thing. People are mostly 100% concentrated, and silent. Some people were ticked off by staff for trying to film a TV screen on their ‘phones, and duly stopped. Some people were live-tweeting, and frowned on by their friends at their table, and duly stopped. There was a sense of both activities being serious breaches of community and commonality; as selfish acts, and as disruptions of concentrated immediate submersion. That was really interesting to see / catch out of corner of eye. I heard people discussing this on the bus, including a couple of amusing quips, but they hadn’t been in this communitarian interactivity: they’d been watching privately. Juliet O’Brien: I remember people who talked about the Harry Potter books being reprimanded as spoilers by those who weren’t reading but just following through the movies: and there’s other examples in serialised fictions that appeared first in book form. I’m in more than two minds about the whole thing (but myself read differently and have no issues with what are usually perceived as “spoilers”); but I do think how we talk about them, and react to others talking about them, is in itself an important thing to talk about and an integral part of community conversations (themselves—as commentary—an extension of the work in question, and thus part of it as A Literary Thing). SKW: That’s all fine for water cooler conversations that begin with, “hey, did you see GOT last night?” Also, Harry Potter books had been available for a while by the time the movies came out. This is more like leaving a movie theater and talking loudly about all the best parts in front of the people lining up to get in. It’s not going to stop them from seeing the movie, but it does rob them of the experience of seeing it for themselves the way it was intended to be seen. Juliet O’Brien: I don’t think I’ve been guilty of that, but I promise to be careful henceforth. SW: Loving that there is a “See Translation” under A’s post. JMcN: I’ve hid at least half dozen people this season. Discussion should be in the comments section for at least 48 hours!! 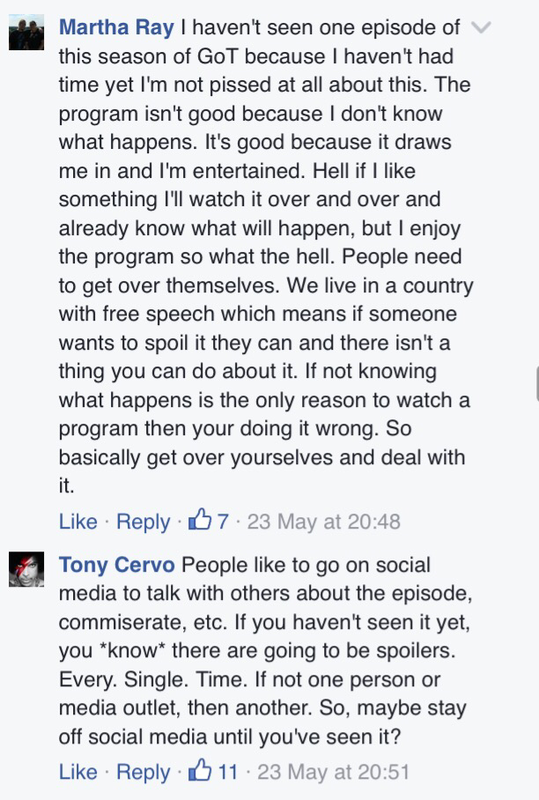 JE: I’m a fan of having a separate group for fans of a certain show who post their nonsense there. If I don’t want to see your spoilers, I don’t join. 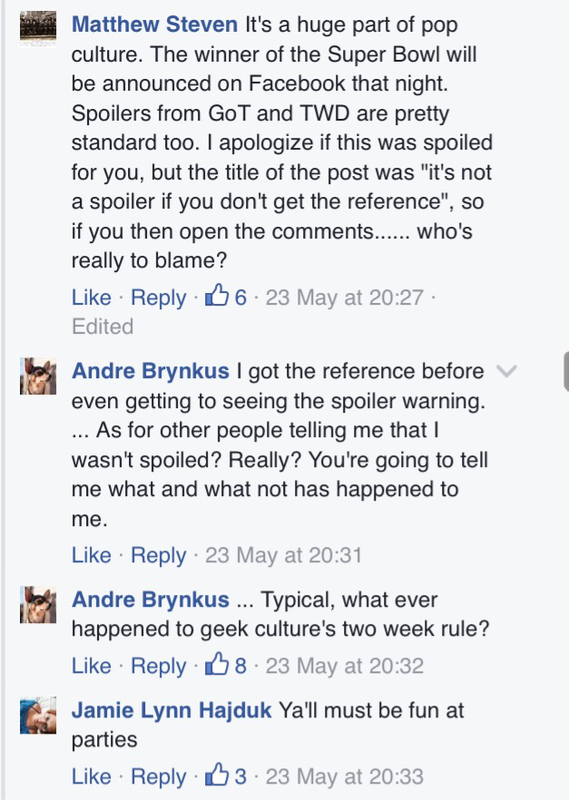 If I don’t care about spoilers, then no grumbling. We did this for Downton Abbey, for example. Juliet O’Brien: There’s always a point: because your reading will always be unique and totally different from anyone else’s, and because the largest part (and part of the point) of narrative isn’t the end result—or a sum of summarised end results—but the how and the why. 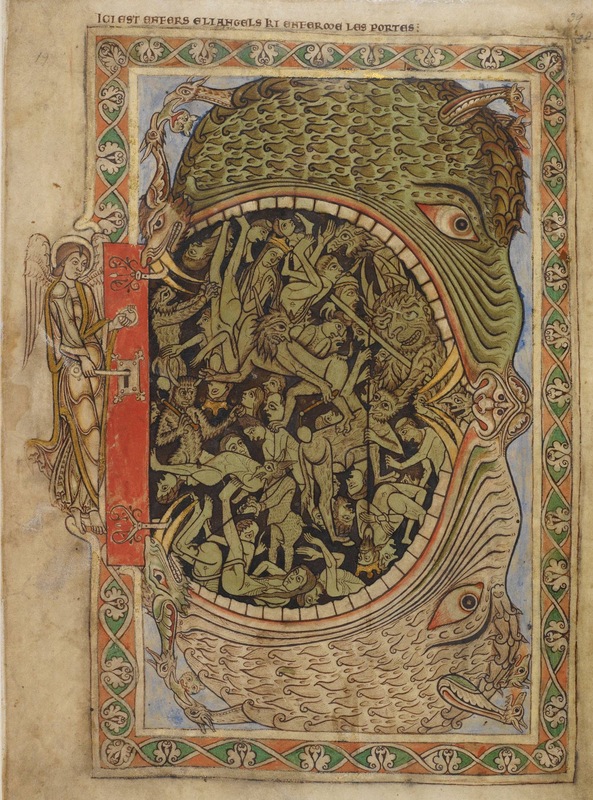 Like going to a medieval theological debate on the existence of God: you know what the conclusion will be, but the fun is how to get there, the journey, the adventure. But I still agree with you that reporting outside a small fan-circle, like a subreddit or a fan site, should assume that the audience is general and hasn’t seen something and doesn’t want to see spoilers. And I promise that I will be careful in future, as a duty of care to friends and out of respect. A problem with FB is that it doesn’t have a “more” tag option. The nearest I can think of would be to write a post that says “this is going to be a thread about [x]” and then anything one actually says of material content would be in comments on that on that original post; that way when the post appears in someone’s FB feed, all they see is that first item, and not the material content (and possible spoilers) in the comments. Would that work? Any other ideas for work-arounds? COMMENT: I care about friends and friendships, and don’t want to hurt the one or the other. I should, and I should extend that duty of care beyond people who are immediate to me: as a Camus-loving, engagée and ethical, responsible adult, conscious and conscientious, sentient and sensitive person. So I will be careful. That’s part of care. 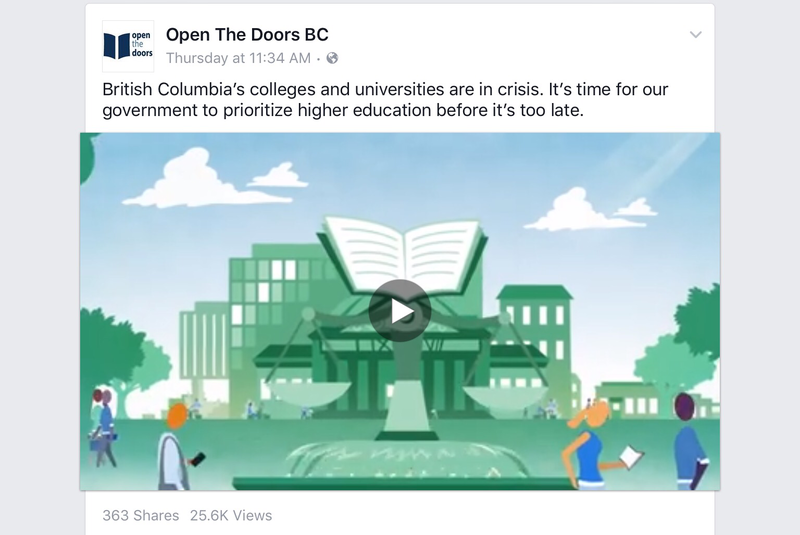 Another item on “open doors”: connected to previous one as many of those concerned are or become UBC students. I’ve taught some extraordinarily wealthy people here. Of all sorts: not all are crass, vulgar, and misbehaved. 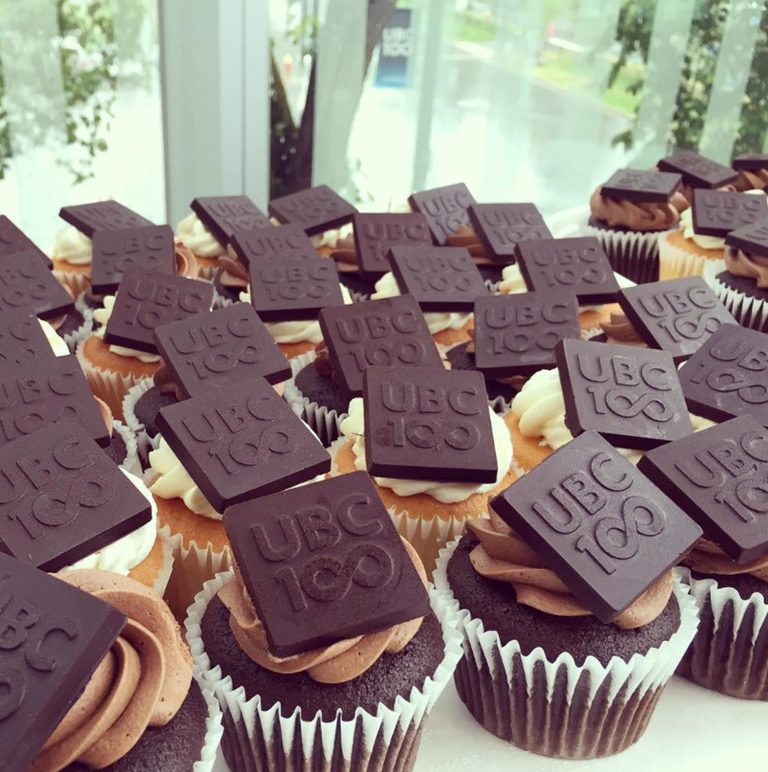 Many are at UBC for good reasons, and reasons that would look familiar to a 19th-c American liberal arts institution. Many are not. Many have serious problems in their home lives, with parents; teenagers and parents are teenagers and parents (and over-protection makes for 18-year-olds having the maturity of pre-teens, with the teens hitting during their undergraduate days). Many parents are over-protective for good reason. The good reason: they care. These are all people: we need to remember that, and the press does too, regardless of race or origin; and we need to beware of visiting the sins of the fathers on the sons. Many of these and other students come to us, be that directly from China or after a few years here, with all sorts of attitudes towards and preconceptions about university; almost all, in my experience, want to “succeed”: this can feel like a problem, can be a challenge, can be an opportunity. To change one idea of “success” into another. To change the point of it all into learning, a love for learning, and a humanities and humanistic love for fellow human beings: here and now, elsewhere and elsewhen, and in the neverwhere and neverwhen of all that we work on in the arts and humanities. Reasons for posting on Facebook and reposting here: many. First and foremost, as a university person who teaches and advises students: remembering that all of our students are fellow human beings: with all that that entails, the strengths, weaknesses, variety, marvellousness, beauty. Second, that our students come to us at a stage in life of tumultuous change. And undergo more transformations while they are with us. A time of marvellous metamorphosis, of transfiguration, translations in the narrow sense and in the broad ones. For anyone watching and (hopefully) supporting and contributing: a time of wonder. To see a new adult human emerge, at some point along the way, and to be content that you might have helped, or at least not hindered. Third: this kind of news item is an incitement to racism. Brute fear and loathing of others who don’t look like you because they don’t look like you. Morally repugnant and politically reprehensible. So: we’ve seen a lot of racism here in BC, of various sorts, against various people, over this place’s entire modern / settler history. 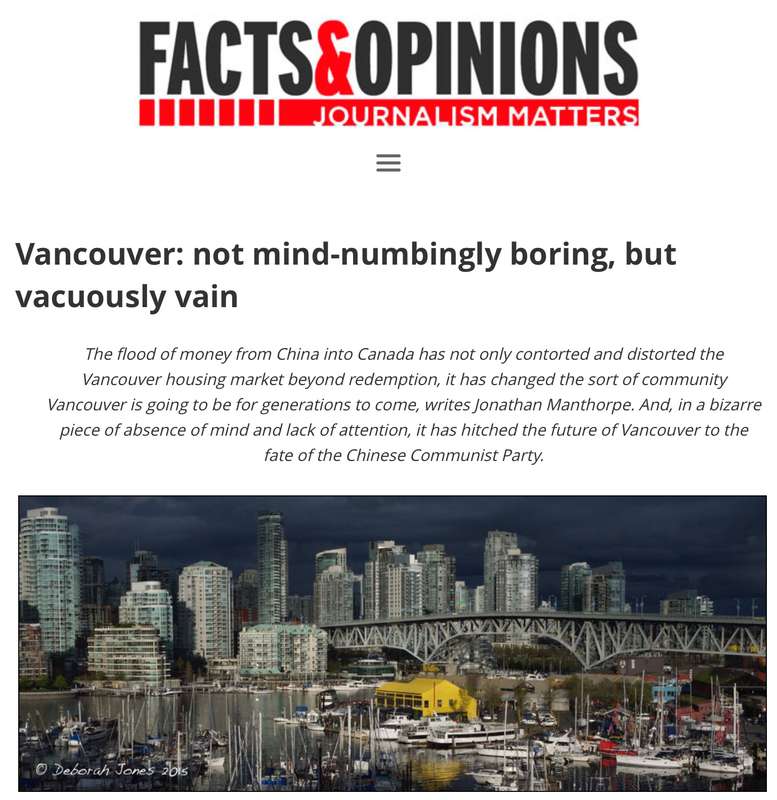 There has been more recently, relating to big money coming into the province from outside, and effects on the housing market. This recent xenophobia is—for the most part, and as far as I have seen—by white people who are good solid Canadians, locals who belong here, and an assault on their territory and their ability to maintain and expand their property. People who belong here and who therefore have more right to be here, and more rights full stop: that is, whose people have been here for between two and five generations. In other words, colonialist settlers. We are also all transitory and transients. Gastarbeitern. Aliens. Temporary. That is an essential element in being human. TH: I am not sure if making the criteria (by their own admission) harder to quantify is going to make things better, stresswise. And it certainly doesn’t help the opacity problem in admissions. The biggest source behind the stress, honestly, is scarcity of positions in each incoming class among “elite” institutions. However you divvy them up, the fact that only some small % gets in will cause great stress. HH: You could argue that it might make things more fair across class lines, and that is important in its own regards, but the stress is still going to be there. Also, aren’t AP courses listed on HS transcripts? Why do students need to list them? It has obviously been ages since I have filled out an admissions form, but how are they not online now, with fields available to student entries (click ‘+’ for another AP course)? I get their implementation is much more than limiting AP course fields on the form, but that just seemed like an awfully bizarre thing to detail in the article. 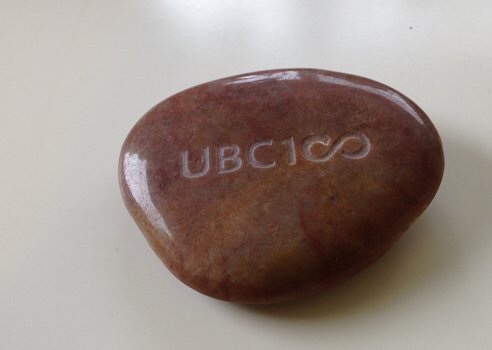 Juliet O’Brien: […] the comparison is with what happens here in BC, and the ridiculous things would-be students (or their parents) feel they ought to do, to seem The Best. They already have average marks in the 85-92% range and we know that marks from BC schools […] what little they mean is […] pseudo-studying to pass tests. I’d favour a return to university entrance exams, with individual components, but in an institution our size it’s not possible. Or: not by actual academics (and we cannot give the university any excuses for continuing administrative bloat or expenditure on contracting out to “specialist consultants,” all of which are cut out from front-line work in teaching & research). We just graduated 13,000 people. Does not compute. Kindness is important as part of feminising the university, and the world more generally, to re-humanise it. 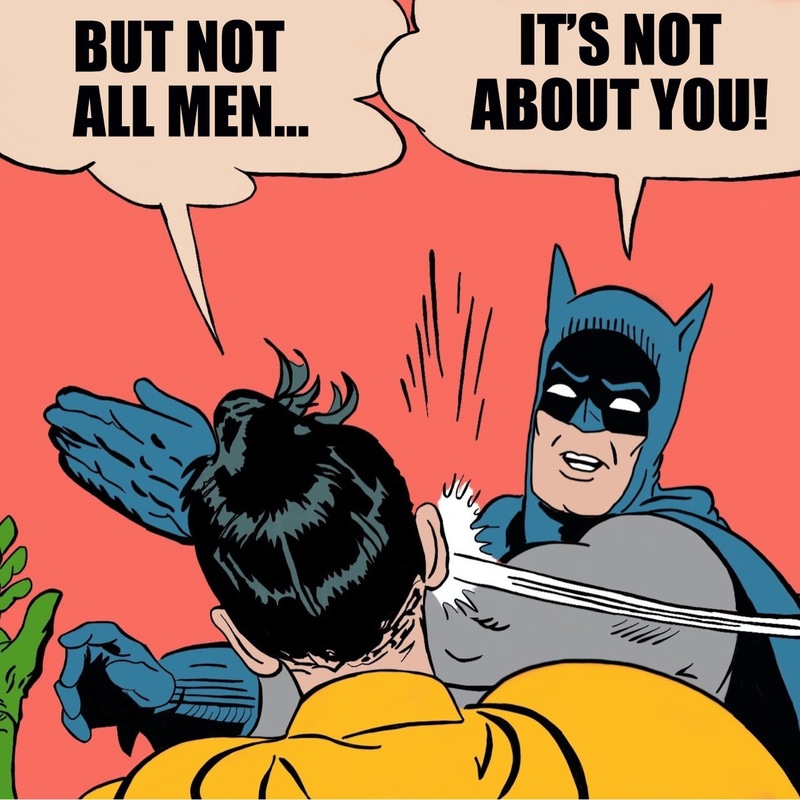 This is a feminist and intersectional social justice issue. And one of and for knowledge, for the slow scholarship movement. Thing is, I see students all the way through—from those starting in September to those who just graduated—who try to pad out their CVs with extra stuff. And others who are working full time while at university full time. And they all do too many courses: usually 5/term, sometimes 4; often to catch up with what they ought to have been taught at high school. Ask […] about math weaknesses. I’ve met grad students whose math wasn’t at the level we had, in a non-mathy school, age 10. So for a BA, for example, up to half the credits are in satisfying requirements (some get away with 1/4 and use them like they were intended, for discovering new scholarly fields and adding to their academic breadth, general knowledge, continuing to develop intellectual curiosity). For both sets—the CV-padders and the workers—they are doing too many hours per week. They have no time to sit, wander around, think, read. To meander and potter, physically and mentally. To do so with others in conversation. Everything, every minute of the day, is scoring points and/or/as money. All of which then further stresses people—this is very real, I deal with such students every year—creating real suffering, especially amongst those who are non-cis-male and non-white. And exacerbates the philistine vulgar Go-Getting attitude, and reinforces The Pseudoliberal Patriarchy, etc. Culturally inappropriate because this isn’t the USA, this is Canada; moreover on unceded First Nations land. NEXT POST: commentary from Saturday, mostly copy-pasted from Twitter, continuing our themes and weaving in ideas on education, learning, life, the meaning of life, a meaningful life, reading and its place within that life of meaning, and so on.